With-Whom-to-Go: Alone, with workout buddies and friends, the fam and kids, etc. The 4-1-1: Disclaimer: please, please please make sure to stretch properly! Even if you're only leisurely walking up or taking a Sunday stroll, still prepare your body for even the slightest bit of physical exertion. Don't be like me and end up with a pulled muscle from not adequately stretching. Or, perhaps you're in better shape than me, so things like "pulled muscles" don’t even affect you. Driving down Jefferson Blvd. in Culver City, you might miss it. Or perhaps you might see the hill, but that’s about it. Or, if you look closely, you’ll see that the hill is actually swarming with tons of tiny figures, and then that’s all you’ll see. 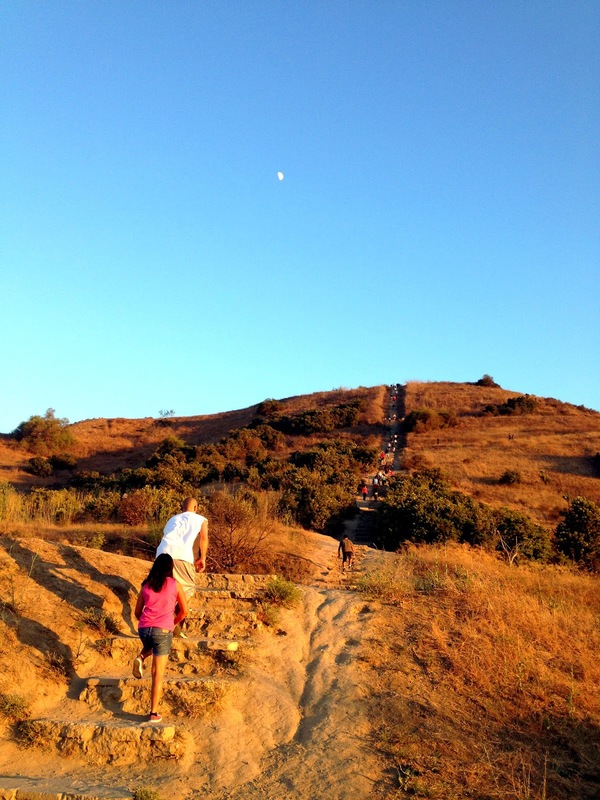 This hill is the Baldwin Hills Scenic Overlook, with access to some of the best free, outdoor workouts and panoramic views that you could ever ask for in the city. Tons of tiny dirt trails that lead up to the top are hidden between the sprawling, rugged, rocky terrain. There are parts that are steeper than others, so make sure to wear shoes with a firm grip. It's not that fun to slip and slide all over the place, and yes, I'm speaking from experience. The trails in total are about a mile to the top and while there is a shorter, quicker way up, you’ve been warned: it ain’t any easier. 282 steps (pictured below) form a stairway leading upwards, but before you say “oh, that’s a piece of cake!” let me break it down for you: these are the most steep, uneven, grueling set of stairs I’ve ever experienced in my entire life. You’ll see people silently huffing and puffing with pained expressions twisting their faces. Seems like everyone’s quiet because they have to focus every ounce of energy onto making it, step by step. Whether you arrive via trails or via stairs, finally at the top, you’re rewarded with sweeping views of the city below. A lot of people take the time to do lunges and sit-ups and other exercises, while many calmly meditate or simply struggle to catch their breath. There’s also a Visitor’s Center (pictured below) that displays information about California’s natural climate and environment, even with a few wildlife samples you can touch. So the next time you’re in the mood to get a breath of fresh air and also sneak in a good workout, I highly recommend planning a trip to the Baldwin Hills Scenic Overlook.